In this practice test you will be required to answer all 5 Sharing With Other Road Users sample questions from Your Keys to Driving in Queensland. 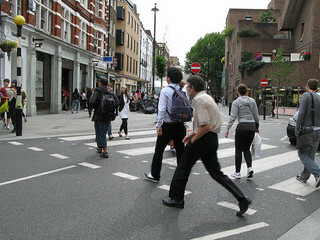 If you are turning at an intersection, must you give way to pedestrians that are crossing the road you are turning into? Only if the pedestrians are under 16 years of age. Only if the pedestrians are over 16 years of age. The speed limit in school zones does not apply if there are no children around. The speed limit in school zones only applies to children from within that school. The speed limit in school zones applies on weekends only. The speed limit in school zones applies on school days during designated times. 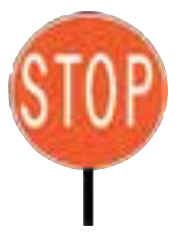 You may be faced with this sign, held by a school crossing supervisor, as you approach a school crossing. What should you do? Slow down until all pedestrians are clear of your vehicle. Stop and remain stopped until the supervisor has returned to the footpath. Stop and remain stopped for children only. You are at a cross intersection without signs, road markings or traffic lights. A cyclist is approaching from your right. Which one of the following statements is true? The cyclist must slow down so you can continue. The cyclist must give way to you. You must give way to the cyclist. If you wave the cyclist on, you should wait for them to pass, otherwise the cyclist must wait for you.